By: Garden Heart ProductionsThe Art of Parking. Cyclists can now park their bikes in a more artful way in front of Science World. 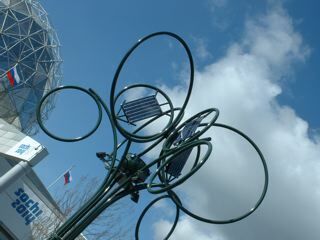 The Solar Bike Tree is part sculpture, part bike rack, part solar powered lamp post. The piece was installed just before the Olympics, but will be officially christened by Mayor Robertson at 5:30 pm, Fri. June 4th during the VACC Bike to Work Week wrap up BBQ.